Eid, Breaking Of The Fast Festival 2013 (Part IV) : The Firecrackers of Food, Fond & Family @ Aidilfitri 2013. God SWT is Great. Eid Mubarak for the year 2013 Thursday, 8th August 2013. The victorious day to commemorate the Moslems’ greatest effort in combating the Nafs was celebrated in a most joyous occasion. For me, it has always been the most simplistic way – not too lavish and not too empty. Just nice; and it is also encouraged for Moslems to celebrate the Eid joyously after a month of battling our own demons inside. On whole, Alhamdulillah that I was still given chance by ALLAH SWT to experience the 29th years of life; executing Ibadah of Sawm in Ramadhan & welcoming Syawal. 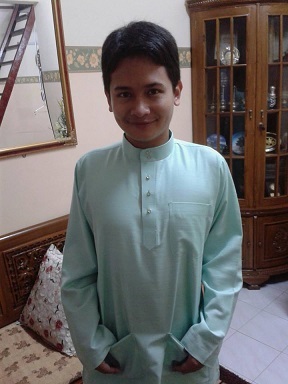 My Baju Raya for this year, 2013 – The Paris Green by Jakel. On the 1st Eid, my parents and I went to pray at the nearby surau called Surau Al-Falah which is located in my housing estate, Taman Suria 3. 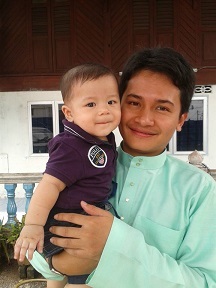 Then, we went to my grandmother’s house; my Tok at Kampung Padang, Jitra. Just hanged out with Pak Ngah Hassan & Mak Ngah Ah who came all the way from Batu Arang, Rawang; and as tradition states; we sort of like “beraya” with each other – that is to ask for forgiveness and apologizing to one another – cleansing ourselves from sins; in conjunction with the spirit of Eid, which is back to basic (Fitr). I joined Ayah to 2 open houses which were of Pak Cik Omar’s & his sons’. 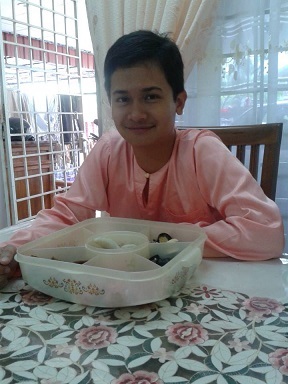 Well, although I am not really in a good liaisons with both, but hey, it’s “Hari Raya”!! It’s all about one enjoying the food and also getting acquainted with new faces. I have no qualm on making new friends or “breaking the ice” – it’s all about making most of my interpersonal skills, y’all! (,”). At Tok’s house in Kampung Padang, Jitra. 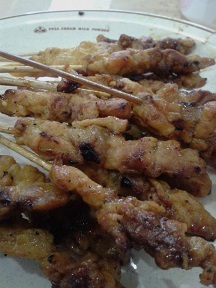 Sumptuous satay at Pak Cik Omar’s open house! On the 2nd day, went to Kord’s house at Kampung Changkat Setol at Changlun. I like his house. 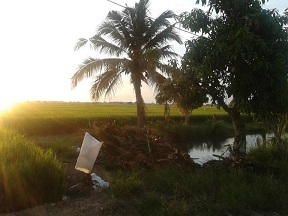 Although it is situated far into the orchards of rubber trees but the surrounding was clean, peaceful and cute. The scene was as if like a drama setting! It was very relaxing! 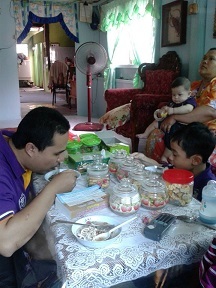 And then, Kord paid a visit to my house at Jitra (his mom persuaded me to join them at their auntie’s house to savour the corn-rice – obviously I got bit AWKWARD and rejected the offer! Hehehe!). Mak cooked “laksa” which happens to be the Northern people’s favourite must-have dish during Eid! At night, I joined Ayah to another open house; this time conducted by Dr. Amir who happened to be a lecturer in UUM; and also an acquaintance to Ayah. I loved the every bit of “soto”, “satay” and the Arabian rice! Splendid! Alhamdulillah! 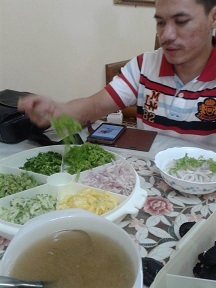 Kord savouring “laksa” in my house. I was in my peach-coloured Baju raya – a sentimental value as I bought it in 2007 with first paycheck working in Affin Islamic Sdn. Bhd. 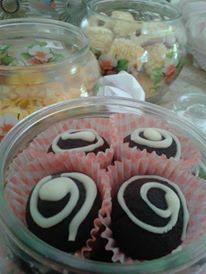 Delicacies in Doctor Amir’s open house. Yummy Arabian rice! On the 3rd day, Kakak arrived via flight with Abang Zam, Rifqi & Raess. We just relaxed at home and spent quality time bonding – with Rifqi now a 7 years old, you can imagine the mischievousness he likes to commit! Hahaha! 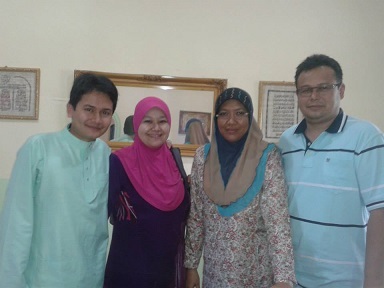 With cousin, Abang Nuar & wife, Kak Hasni. On the 4th day, we pushed to Province Wellesley or now famously known as Seberang Perai! Kakak and I tried to make an appoint to visit Ayah’s side of the family since now that we can drive our own. 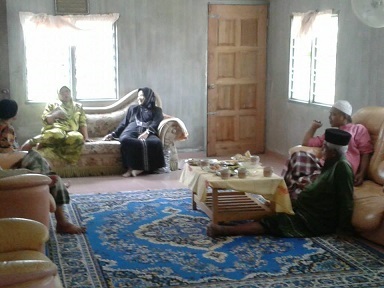 The first stop was at Mak Ngah Nah’s house at Lahar Kepar, Kepala Batas. 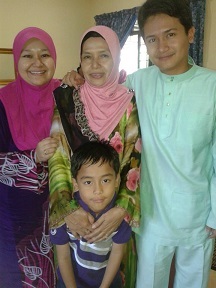 Kakak and I are always quite close with Mak Ngah and our cousins there so it was natural for us to visit her first. Abang Nuar & Kak Hasni also were there and seeing Kak Lia now pregnant with her first child was an “awww” moment. But of course, our hearts always go to our dearest Kak Aida who is still struggling with kidney failures. Really admire her courage and I pray she stays strong! Amin, Ya ALLAH! We all love her and her spirit! Amin….! 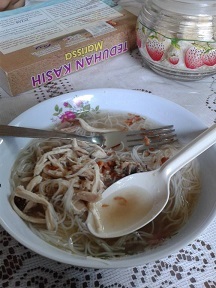 Savouring delicious “soto” at Mak Anjang’s house in Permatang Berah, Penaga! Next, we stopped at Anjang Yop’s house which was formerly our grandfather’s; Wan Mail’s house at Permatang Berah, Penaga. Unfortunately, he was not there as he attended some wedding ceremonies; but Mak Anjang was there. 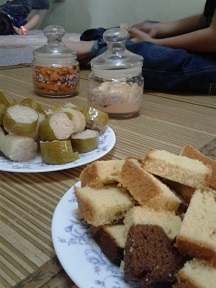 As an annual ritual, Mak Anjang always cooked various types of foods for the Eid specifically for one day and the next. 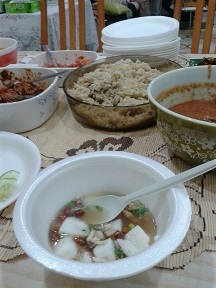 It was nice to be served with “soto” for this 4th Eid and we really enjoyed Mak Anjang’s food! Yummy! We then make a stop at Telok Ayer Tawar to visit Pak Long Wahab but unfortunately, they were at Bukit Mertajam attending weddings, too. However, pictures in front of the house will compensate, no? Hahahhaa! 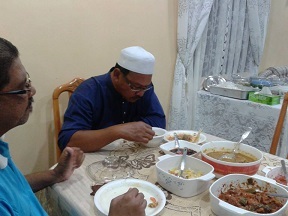 We also couldn’t make it to Pak Su ‘Id’s house at Permatang Pak Maras because he said earlier that he won’t be at his house on the 4th Eid as he had few engagements to attend; and we ourselves couldn’t change the date. Hence, the collision!… sigh. After that, we crossed the Penang Bridge to our Island Home, Penang!!! Yeay! Kakak has been craving for “Penang Nasi Kandar” since she was pregnant with Raess; so this trip was meant to alleviate her crave! Hahaha! But before that, we went to Abang Zam’s friend’s house; Abang Zaidi which is located in front of Batu Lanchang’s Market. Stepping inside the 9th-floor flat really evoke nostalgic feeling for Kakak & I as we were raised in FRU Flats back in Rifle Range area; just like this Batu Lanchang’s flats. The aura, the atmosphere, the ambiance were nostalgically refreshing! 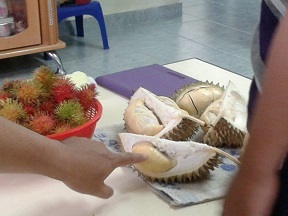 We were lavished with durians (yummy!) 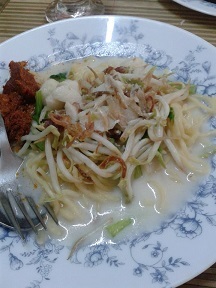 and rambutans AND the most DELICIOUS home-cooked Laksa ever!!!!!!!!!! As a laksa freak, I actually braved myself to eat TWO BOWLS of Laksa; and even Kakak who was supposed to be in “pantang” (confinement postnatal period) and she technically isn’t allowed to eat “laksa” as it is dubbed as a ‘cold’ food) couldn’t resist the temptation and savoured the fish broth! Yummy!!!! So happened that actually, Abang Zaidi’s mom, Mak Su has been cooking “laksa” for occasions and her name is quite a household. Delicious! Simply THE BEST!!!!! Yummy!!! 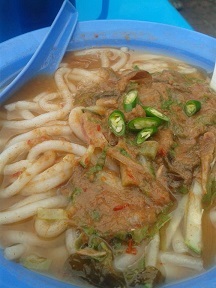 We love Mak Su’s (Abang Zaidi’s mom) laksa!!!!! The prawn paste adds the lips-smacking taste! 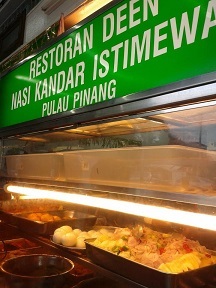 We then went to “Nasi Kandar Deen” in Jelutong which is just a stone-throw from Abang Zaidi’s house. 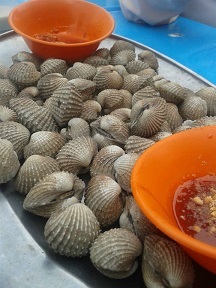 Kakak was so eager and craving for “squids’ eggs” (I did write about this in the USM alumni magazine (Refer to : https://undomiel84.wordpress.com/2012/12/17/the-diary-of-a-salt-water-people-embracing-my-island-home-penang/). 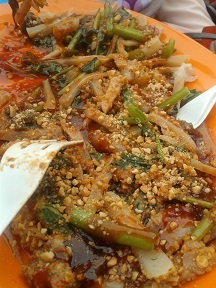 Simply delicious as Kakak also bought another 3 rice-wraps for us as well! Hahahah! Quenching Kakak’s crave on “Penang Nasi Kandaq”!! People queuing up in a long line! On the 5th Eid, we pushed to Kuala Nerang to visit Kak Wani who has just given birth. She is now in her confinement period in Pak Cik Sani’s house. It was nice to meet Kak Ayu and all the familiar faces and we were lavished with sumptuous cakes and “mee kari”!! Yummy! 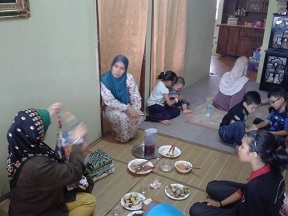 Then, we proceed to Abang Zam’s sister’s house at Kampung Senggora, Pendang. I like the village as it is a beautiful scene! Tranquil and serenity…. Subhanallah! Beautiful! God SWT is Great & Almighty. At Pak Cik Sani’s house in Kuala Nerang, Kedah. Kakak discussing some business opportunities with Kak Ayu?! LOL! 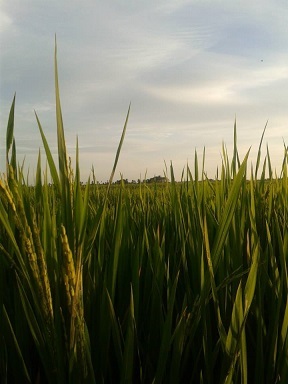 The beautiful serene scene of paddy-fields at Kampung Senggora, Pendang. Subhanallah! On the 6th Eid, Kakak had to settle her IELTS documentation at Pulau Tikus, Penang. 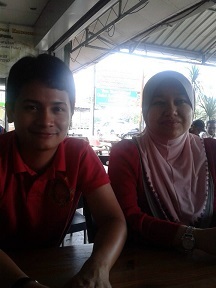 Since Abang Zam had to dash back to KL; I accompanied her along with Rifqi. We managed to find the IDP Education Centre which is opposite the Belissa Row, Pulau Tikus. It felt really refreshing to enter the centre with smells of education books, pamphlets and brochures! 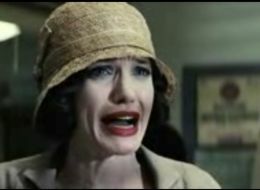 Who knows, I shall imitate her if she does well in her test? Time will tell; though I have reluctance to let go my current life, now. 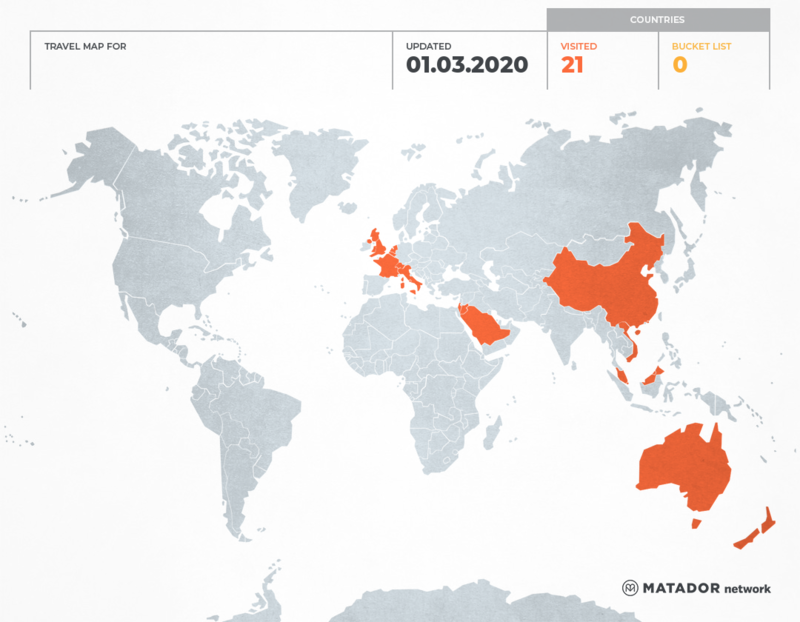 Hard decision need time to deliberate…. Had drinks at Coffee Bean in Belissa Row (my favourite Caramel!) 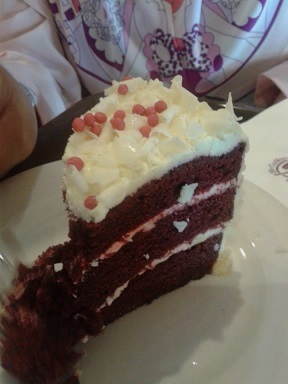 and Kakak had her Red Velvet cake. Yummy! Anyway, after that, we feasted ourselves with Penangites’ delicacies at the Old Padang Kota with “laksa”, “ais kacang”, “sotong kangkung” and steamed cockles! 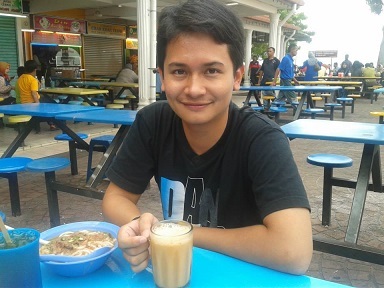 Not to forget the authentic “Penang Teh Tarik” y’all! With the sea breeze and the Penangite dialects; it makes the trip worthwhile, really! When we arrived at home in Jitra, we saw that Pak Ngah, Mak Ngah & Tok were at there. It was a nice wrap-up for our 6th Eid! 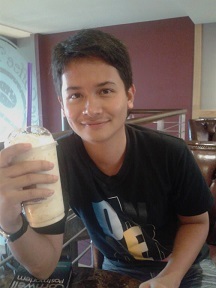 Coffee Bean’s Caramel…. & Red Velvet Cake at Belissa Row, Pulau Tikus. Penang. Delicious!!! Food at the Old Padang Kota – “Pasembur”, “sotong kangkung” and steamed cockles! 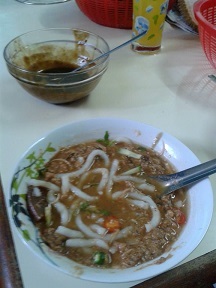 Penang “laksa”!!! Argh…. my mouth just waters! 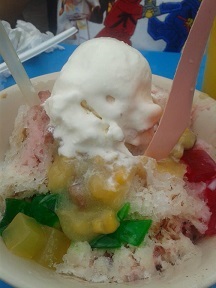 Rifqi’s “ais kacang”! Never get bored snapping the Penangite Ais Kacang! On the 7th Eid, we attended a wedding ceremony hosted by Pak Cik Tazri or affectionately knows as “Tajri” (I guess it’s just a nickname!) for his sister at Banai, a rather secluded area in Jitra nearby Kelubi. The food was satisfactory!! Love it! 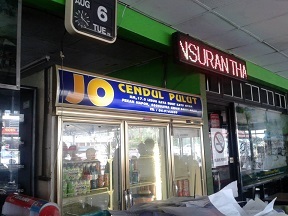 And then on the way back, we went to Napoh to savour the ever-so-popular Jo Cendol Pulut! People keep talking about it and I never tasted; so I took this opportunity to taste. The verdict??? I just LOVE the “cendol pulut”!! 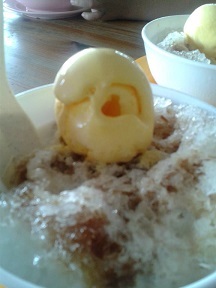 Yummy; and putting scoops of ice flavour on top of the “cendol pulut” doesn’t hurt either! Delicious!!! 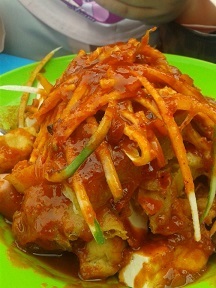 The famous Jo Cendol Pulut at Napoh, near Kedah. Simply love it! After all the food marathon and the icy water; I got myself with possible-Tonsilitis! Tried to alleviate it with Panadol and some traditional herbs as suggested by FB friends such as onions and cloves. Well, they did wonder and my throat was getting better, Alhamdulillah! (,”). You know, when you are in Northern region, it’s all about the food! Yummy! Well, no wonder I am getting fleshier, right? Well, whatever people say; I love my new flesh. (,”). Alhamdulillah, so far at this juncture it has been a blessed Eid – moderate & temperate yet enjoyable. (,”). ← Eid, Breaking Of The Fast Festival 2013 (Part III) : Adieu Mois Ramadhan 2013.